A key message from the second annual IfM Digital Supply Chans Consortium meeting was that organisations will prosper from rapid experimentation and early adoption of new technologies. Instead of placing resources and hedging bets on just a few technologies, through experimentation organisations can rapidly assimilate knowledge of what works, quickly drop projects that fail and invest in programmes that clearly demonstrate they can deliver value to the business and customer. On 27th September, senior supply chain strategists from organisations including ABB, Caterpillar, Grundfos, IKEA and Philips Lighting gathered at the Institute for Manufacturing in Cambridge for the annual Consortium meeting. During the day, the group discussed their internal initiatives, considered the implications of new research for their organisation and discussed opportunities and challenges of mutual interest. Per Berggren (Industrial Strategy, IKEA Industry) commented “The day was invaluable. To hear from and share ideas with organisations that are implementing a range of digital initiatives across other sectors provided me with lots of ideas – it reinforced our thinking on digital as well as giving me some fresh ideas to consider for our company”. 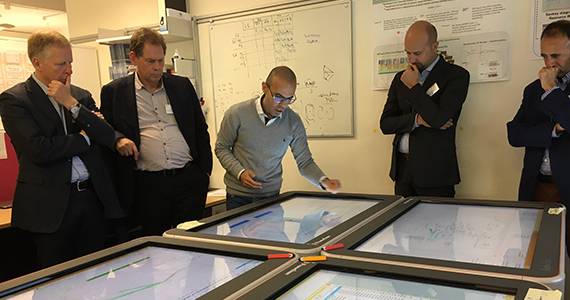 The group also had the opportunity to see a demonstration of the IfM’s Digital Supply Chains Lab, covering some of the latest research and digital tools for supply network design, simulation and analytics. Dr Jag Srai, Head of the Centre for International Manufacturing at the IfM commented “There were many emerging themes arising for the day which will continue to shape our research agenda and priorities. For example, the cost of technology is coming down so rapidly it’s no longer seen as prohibitive. Instead other factors like organisational structures, culture and skills gaps are proving more of a barrier to adoption. Equally, our development of new supply network design approaches and tools provide exciting capabilities for firms with complex challenges on the viability and impact of new production, process and supply technologies on their manufacturing supply chain footprints. As a shared challenge across the group this is an area where we can further our collaborations to provide new insights for Consortium members”. The next meeting for the Digital Supply Chains Consortium will be 26 September 2018. The IfM Digital Supply Chains Consortium is a collaboration between industrial member companies and the Institute for Manufacturing Centre for International Manufacturing. It brings together some of the world’s leading firms and academics, all of whom are focused on delivering the tools, education and insights needed for the supply chains of the future.